Located on the 20th floor of the west tower in the Sloppy Floyd Building just across from Georgia's State Capitol building, the Empire Room offers guests a spectacular view of Underground Atlanta, the State Capitol and Turner Field baseball stadium. A view that is spectacular in the day becomes extraordinary after dark. The Empire room offers a dance floor, coat check and small lounge area. 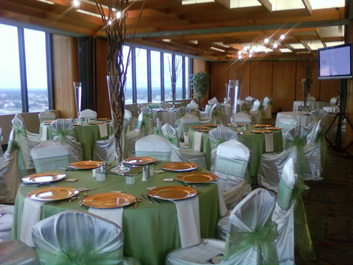 This facility will comfortably house 125 guests for a seated event and 200 guests for a standing reception. The Empire Room is an ideal location for breakfast meetings, seminars, luncheons or evening receptions.